So I’m driving east on Interstate 40 headed towards the coast and I am way, way beyond anything resembling civilization. There isn’t, and isn’t going to be a rest stop or turn off to break the monotonous view for miles. The only thing I have to look forward to is the upcoming exit for Faison, NC—the proud home of the Mount Olive pickle. It’s boring as hell but I don’t really mind, because I have the audio version of the Iliad playing and Achilles is wreaking havoc among the Trojans. It’s been five long books, but he has finally gotten off his duff to fight and is slaughtering the enemy left and right. “Rage” intones Homer, “red, red Rage”. The Bard has long since stopped talking about the “flashing helmets” of the armies and the “bright armor” of the heroes. Now it is all blood and gore—the spatter of it as Achilles’s chariot drives over the bodies of the fallen—Greek and Trojan alike—the way blood and tissue sprays up onto the flanks of his galloping horses, the way it cakes the wheels and sides of the chariot, and coats his outstretched arms. The red rage of Achilles becomes an inferno when he sees Hector, the great Trojan warrior, on the field of battle wearing the armor he stripped from Petrocles, Achilles friend and lover. And he leaps towards Hector mad with wrath, shouting, shouting in his fury and anguish and Hector flees all the while begging for mercy although he knows there is none to be had and the noise of war is incredible, roaring, and even the goddess Athena is shrieking and all of a sudden woooo-wooo-ooooo…. …I get pulled over by a sheriff because I apparently blew by him doing 85 miles an hour and never even saw him. I enjoy audio books—they help me with the tedium of monotonous house-cleaning tasks, they make the time go by when I’m doing yard work, and of course they are invaluable in the car, especially since I had moved out of town. It takes me at least thirty minutes to get anywhere. Audio books are a kind of inoculation against road rage. My trip into the classics began when a good friend gave me the audio version of Virgil’s Aeneid. The Fitzgerald translation, read by Christopher Ravenscroft. It was a few weeks before I found myself on the road with nothing new to “read”, so while keeping one eye on the logging truck ahead that was hogging up highway, I rummaged around in the box between the seat for an audio book that felt unopened, and came up with Virgil. On the theory that it was a classic for a reason and therefore must be pretty good, I tore open the plastic with my teeth, swerved slightly as I tried to extract disc number one, and settled in for the next four hours prepared to hear about the travails of the Trojan survivors looking for a new land to call home. I already knew the story, of course. I grew up on Edith Hamilton’s Mythology and Frazer’s Golden Bough. Like most little kids who liked stories, I loved myths and fairytales—they are the basic building blocks of literature, as fundamental to the written word as the primary colors are to an artist’s palette. So I knew that Aeneas would find refuge in Carthage. That the queen of the city would fall in love with him. That he would leave in search of the land fated to be his new home. That the refugee Trojans would fall afoul of god and goddess alike in their wanderings, before coming at last to the soil that would eventually be Rome. What I had forgotten, and what held me so utterly enthralled that I missed my damn exit and didn’t notice for at least five miles, was that these poems were meant to be performed. Recited. Heard. Experienced. Passages that had been merely repetitious when read on a page became rhythmic and sonorous in the reader’s rich voice. I started to feel lulled by the beauty of the constant references to “wine-dark sea” and the “Dawn, touching her rose-red fingers to the sky”. I shivered at his descriptions of “Rumor…A huge and horrid monster covered with many feathers: and for every plume a sharp eye, for every pinion a biting tongue” as it appeared again and again to thwart the hero’s way. I spent a week with Aeneas, and then went out and found copies of Homer’s Iliad and Odyssey. I spent at least a month with Achilles and Odysseus. 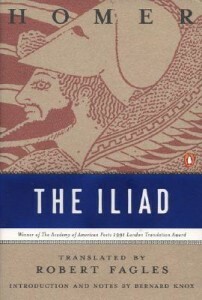 For the longest time when friends asked “what are you reading” I found myself talking about the battles of the Greeks, about Calypso’s desperate love for her shipwrecked sailor, about Telemachus, waiting bitterly for the return of a father he last saw when he was a baby. I got a few very odd looks. I had also forgot—or perhaps never properly understood—that these epics were Literature (note the capital “L”). They were narrative. They had plot and character development. They were psychologically fraught. The Aeneid isn’t just a story about the founding of Rome. It is very much about how men and women live in a constant state of war. What it means to be honorable or loved in an era when everything is settled by “the blood of your enemy dripping from your sword“. There is an intensely vivid moment in Virgil’s epic where the poet describes the hero striding through the ruin of Troy, lit now only by the sputtering flames of burning buildings when he suddenly catches sight of Helen in one of the gaps between billowing smoke clouds. She is cowering and afraid. He is filled with black rage at the sight of the woman responsible for the destruction of his city, and their eyes meet across all the chaos–she knowing she will die, and he ready to kill…until the gods whisper in his ear “but what of the fate of your own family? Are they safe?” He gasps and shudders, and wrenches himself away from the flaming city to seek his wife and son. Helen, we last see, crouching in the remains of a temple that offers nothing in the way of sanctuary. Epics like the Aeneid, the Odyssey, the Iliad (well, scratch that, because nothing is really like the Iliad), are full of these intense personal moments. 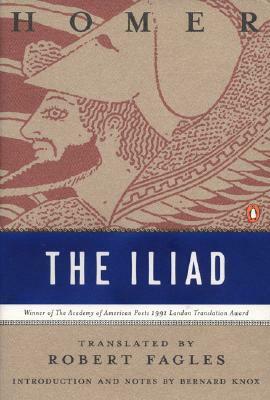 There is a beautiful scene in the Iliad (Thomas Cahill mentions it in his lovely book Sailing the Wine-dark Sea: Why the Greeks Matter) where Hector, about to go off to battle, stops to play with his infant son, and the boy starts to cry—frightened by the war helmet crowning Hector’s head. The father laughs, takes off the helm, and dawdles the child until he is smiling again. I’ll tell you something about the legend of Troy—that scene isn’t in the myth. It is a piece of sheer poetic brilliance. Homer isn’t interested in national founding myths. He isn’t overly concerned with the religious devotion to the gods. He is interested in what it is to be human. The travels of Odysseus were always entertaining—a kind of classical pulp fiction where the pace and the action just never let up. First he defeats the Cyclops. He confronts the Sirens and escapes. He barely survives the clashing perils of Scylla and Charybdis. But the scene that sent shivers down my spine wasn’t any of these; No, it is the homecoming scene, where Odysseus returns to find his house overrun by worthless young men attempting to bully his wife into marriage. Re-acquainting myself with the epics of Homer, the poetry of Virgil, made it hard to read anything else that month. I found myself looking for excuses to get in the car, drive around, listen to the next stage of the hero’s journey, the next campaign in the battle. Somehow, the new “Miss Julia”, or the paperback re-issue of the DaVinci Code just didn’t seem so important compared to Dido, frantically begging the man she has secretly married to stay, stay, just for one more season, one more month, even one more day. Listening to the ballads, losing myself in the sheer joy of the language and the fierceness of the stories, re-invigorated my reading. It also made my driving rather reckless, but I was lucky. The sheriff was either a poetry lover or amused by the novelty of a woman speeding along the highway listening to Homer. He let me off with a warning. There is a scene in Betty Smith’s A Tree Grows in Brooklyn where young Francie Nolan makes her weekly pilgrimage to the library. She has an ambitious project to read every book there, and in the methodical way of children she started at the “A’s”. She is now into the B’s, and is feeling a little discouraged because she is finally almost done with the ‘Browns” only to discover that there are still dozens of “Brownes” to come. Francie checks out her books and walks the several blocks home, stopping only once by the five and dime to purchase some penny candy. Once at her tenement, she retreats from the noisy family apartment, climbs out onto the fire escape landing outside her bedroom window, shaded by one of the scrawny trees in the back yard (she calls them “trees of heaven”), and settles in to her private space to read for the rest of the day, a small cracked dish of penny candy by her side. I was about Francie’s age—nine or ten–when I first read about her attempt to read every book in the library. I didn’t think it was odd. Like Francie, I made weekly trips to our neighborhood library. Like Francie, I was in the habit of holing up in a secluded space with a bowl of junior mints and a stack of books, not to resurface for the rest of the day. I could admire Francie’s goal to read every book from A to Z, although I was too easily distracted by the lure of all those books to be so methodical myself. Like Francie, I read books because I wanted to KNOW things. I believed what I read in books, and looking back now, I can see that I didn’t make much distinction between fiction and nonfiction. Pippi Longstocking was as real to me as the books on dinosaurs and sharks and space I was equally obsessed with. My mother walked my brother, sister and I to the Fairfield Branch library in Buffalo, NY, about once a week—a feat of dedication which I now look back on with some awe. It was a seven block walk and it can’t have been easy to do with three kids under the age of ten. Sometimes my best friend Kathy from across the street came with us, but her mother wasn’t as diligent as mine about having new books to read every week. I was glad I had my mother and not hers, although my mother insisted we return the books when we were done—something I always objected to. It is an acquisitive tendency in me that explains why I became a bookseller, not a librarian, when I grew up. 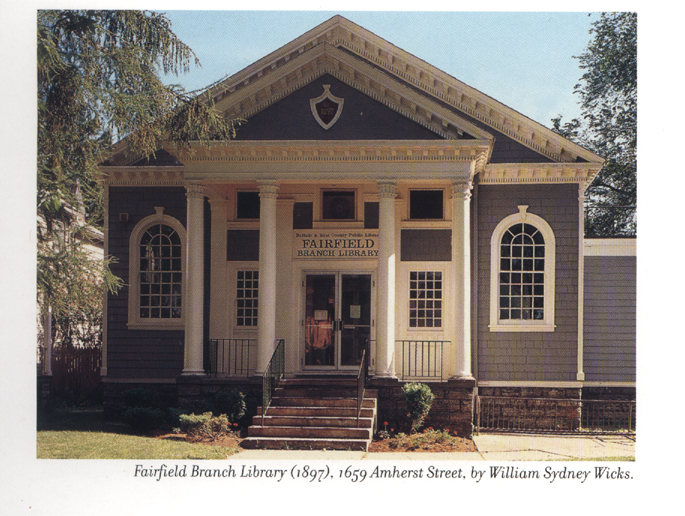 The Fairfield Branch Library was built in a neo-classical style and at the time I thought it was the biggest building I had ever seen. Its marble-white steps led up past pillars that rose above most of the trees. Inside, it was one large room with two-storey-high ceilings pieced by windows at the top through which the afternoon light poured in. Tall wooden bookcases lined all the walls, jutting out at intervals to mark different “sections”. The librarians were at a round enclosed area in the middle with a swinging gate I was just beginning to be able to see over. The card catalog, with its dozens of little wooden drawers and typed labels in brass holders encircled the librarians, who kept an eagle eye on us when we wanted to look something up. I don’t remember who first taught me how to use a card catalog, but I have very clear memories of carefully opening the “H” drawer to see what books they had by Marguerite Henry. Walk in, and the children’s and young adult books were on the right. I remember this because I would often follow my mother to the left instead, leaving my friend Kathy with her “B is for Betsy” and instead dogging the heels of my mom because I always wanted to read what she was reading. To the left was fiction. Presumably adult, although mom seems to have found enough to interest a ten year old girl willing to be interested. Around back behind the librarians’ island the floor went up several steps to where they kept the adult nonfiction books—thick books on history and science, biographies and poetry. To the right, past the kid’s section, were the how to books—the gardening and knitting and cooking books. It was a cavernous place, almost like a church. In fact, it was so much like a church in my mind that for years after I had grown and left home, I was convinced that it had a high domed ceiling, like the Hagia Sophia, with which the Fairfield Branch library was somehow equated in my mind. On some level, I thought of them as the same KIND of building. Of course, it was nothing of the sort. The Fairfield Branch of the Erie County Library is a small place that despite its historic status (the building dates back to 1897) is currently scheduled to be closed by a financially strapped county. The front steps aren’t marble, merely a clean-swept concrete. The pillars don’t reach above the trees, merely about one and a half storeys. And the building itself, despite its classical trappings, is merely a tiny box with grey shingles and white trim. A far cry from the cathedral-like atmosphere I had been giving it in my memories, but my childhood instincts weren’t all that misguided—according to county records the building was originally created to be a church. Anyone who walks into the Fairfield Branch Library today could hardly call it “cavernous”. It is a tiny, one-room library not really much larger than the two bedroom house I live in now. The space between the front door and the back wall, where all those weighty history books were kept on what would have been reserved for the church altar, can be crossed in about fifteen or twenty steps. It is entirely possible that I have more books in my house than it does on its shelves. And yet, yet….it remains expansive in my mind, and I can’t shake that feeling of vastness, even when confronted with the realities of floor plans and blueprints. It is all those books, of course. There is an early scene in CS Lewis’s Narnia story The Lion, the Witch and the Wardrobe (first discovered on the shelves of the library), where the Professor explains to Lucy that things can be bigger on the inside than they are on the outside. This is true of any room full of books—which never feels close or claustrophobic to me but rather bulging with the promise of the undiscovered. But it is especially true of my childhood library, which was my very first room full of books and the starting point for so many literary journeys. The Fairfield Branch of the Erie County Public Library may measure fewer square feet than my neighbor’s three-car garage, but is still as far-reaching as the books it holds, and it will always be ever so much bigger inside than it looks from without.